Mirrors can be found throughout the home, but unless you follow the proper guidelines for feng shui mirrors, the position is often incorrect. A mirror placed in the wrong location can do more damage than you think. What you normally use for home decor and vanity purposes is actually a very powerful tool that may cure the bad 'qi' or energy of the space and shift its flow. There happens to be three ways in which mirrors can effectively be used as feng shui remedies. These are expansion, reflection and deflection. The aim of expansion is to create the illusion of expanded space and is usually used in areas like narrow hallways where space is cramped and limited. Typically these areas have stagnant 'qi' and the illusion of extra space may help it flow freely. The purpose of reflection would be to double the total amount of anything that faces the mirror. This really is a good thing if positive images are in front of that mirror, as it will double that image and create more positivity. On the other hand, the same can be said for negative images. As an example, avoid clutter in front of the mirror, because that only increases the total amount of clutter and the negative energy that it represents. The purpose of deflection is to combat negative energy on the outside. In this case, a bagua mirror is placed either on a front door or window facing outside of the home. This technique is effective when there are actually sharp corners aimed toward your home, when there is incoming traffic headed straight towards your home or more. You will find both good and bad locations for a mirror. One of the most effective uses of a mirror is to place it behind a stove in the kitchen. The kitchen is thought to be the area of the home that relates to the wealth and success for the entire family, and the burners on the stove is considered the place where wealth is generated. So according to the rule of reflection, the mirror doubles the image of burners, essentially creating more wealth. One of the worst places for any mirror is facing the foot of your bed in the bedroom. It is believed that the mirror will steal the soul of a person when he or she is sleeping. This is definitely not something that you'd want to happen. It is possible to resolve this issue by simply rearranging the furniture in this particular bedroom so that the mirror no longer faces the bed. Feng shui mirrors represent the water element and are great in areas of a room or an entire home which is associated with water. Just use a bagua map to figure out the placement of each element. Avoid placing it in areas that represent the fire element, because water puts out fire so it may have a negative affect on that area. Other key things to watch out for are placing two mirrors that face each other, it bounces the 'qi' off continuously and that is not a good thing. 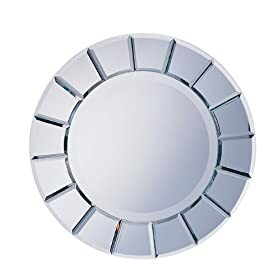 Smaller mirrors needs to be hung on your wall at face level to avoid cutting off your reflected image. All of these factors are essential in determining the perfect location for mirrors inside your home. Feng shui mirrors are often used as one of the most popular feng shui cures to tackle negative energy. Use a bagua to find auspicious places to put it throughout your home.